Sealy Hybrid Premium Mattress Reviews - Is the Silver Chill for You? 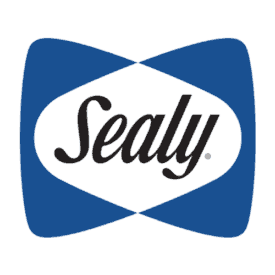 I’m particularly jazzed about this review because I’ll be continuing my exploration of the Sealy Hybrid Line, which is made up of three distinct collections: the Essentials (least expensive), the Performance, and the Premium (most expensive). After assessing the Essentials, I’ll now turn my attention to its fancier sister, the Premium. 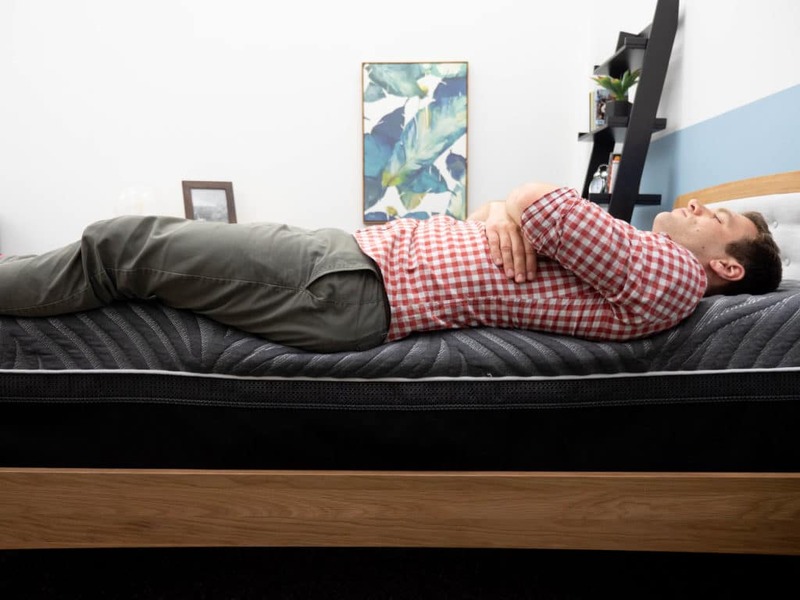 While I’m intrigued by this model’s extra cooling and Tempurpedic technology, I won’t know how comfortable it actually is until I put it to the test, sussing out how it feels, how it sleeps and whether or not it could be the bed of your dreams! I should note that the Hybrid line isn’t available from Sealy itself, but can be readily purchased through Sears, which markets the Premium as the Sealy Silver Chill Firm. 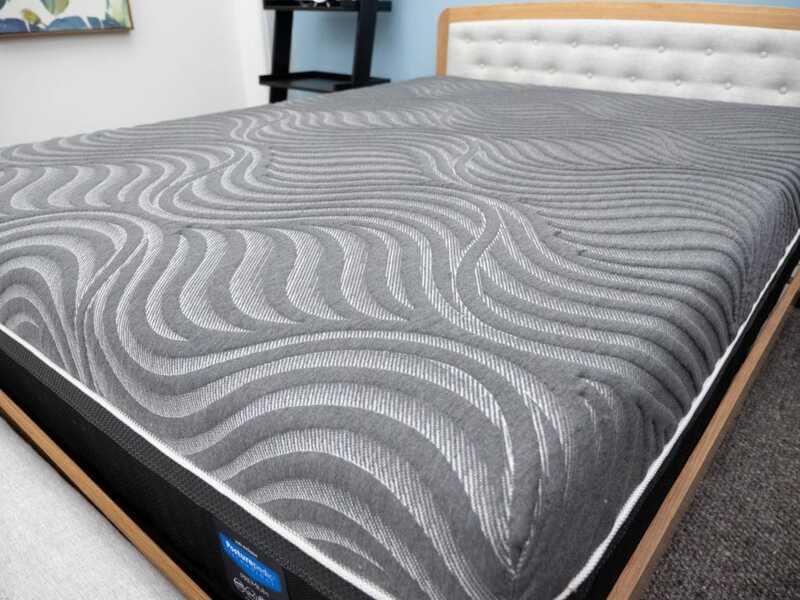 Low motion transfer and excellent edge support make the Sealy Hybrid Premium a great fit for couples! Like the Sealy Hybrid Essentials, the Premium features a 14.5” profile of just two layers: one of memory foam and one of pocketed coils. 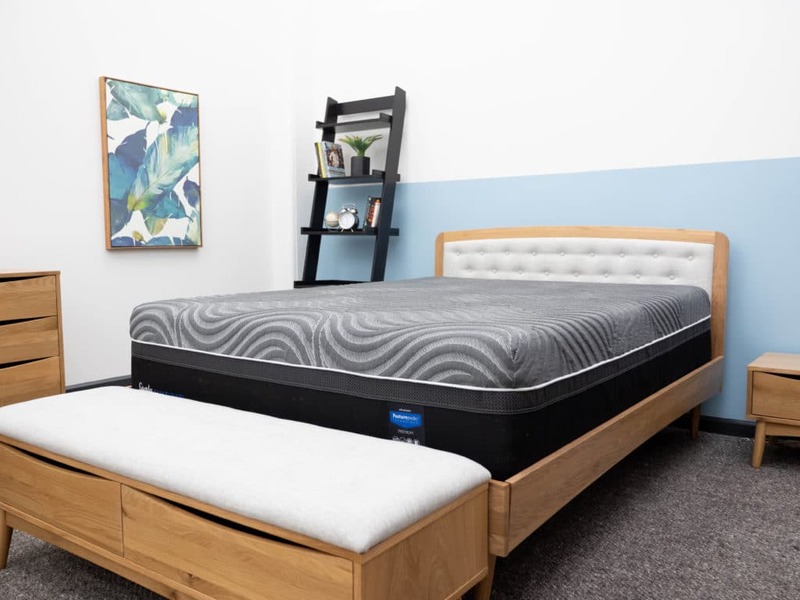 While the two constructions are certainly similar, closer inspection reveals that the materials in this bed are more advanced than those in the Essentials, with extra cooling in the memory foam and added Tempurpedic tech in the support coils. Another difference is that while the Essentials only comes in Firm, the Premium comes in Plush, Ultra Plush and Firm. But for the purpose of this review, I’m only looking at the Firm version. But enough chat! Let’s dive on into these different layers. Cover – Made up of the brand’s ChillTech UltraStretch material, the cover is soft and cool to the touch. The fabric has a knit quality to it, which makes for a cozy feel for some immediate comfort. 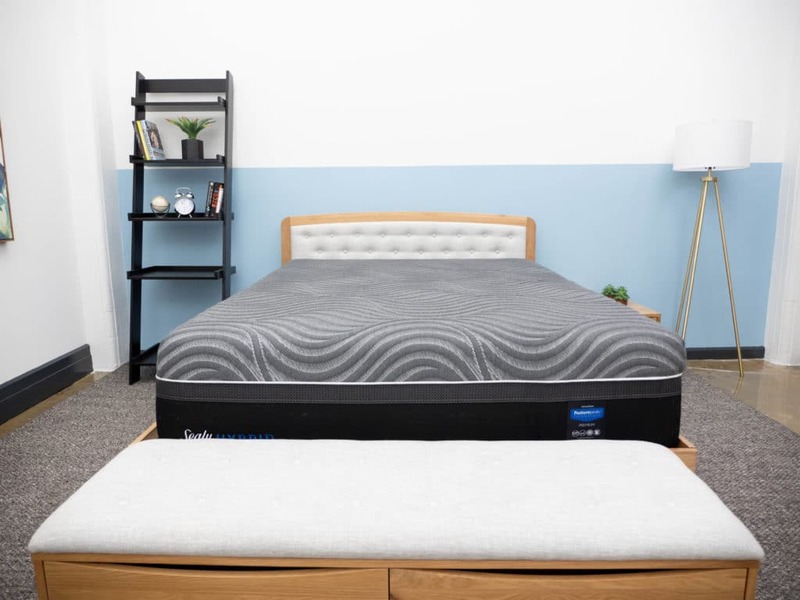 Comfort Layer – Next up, you’ll find a thick layer of what Sealy calls its “Advanced Memory Foam,” which provides the sleeper with some deep body contouring and pressure relief. The foam here is a bit denser than that found in the Essentials, allowing you to really sink into the material for a snug feel. And while this intense sinkage would normally lead to overheating, Sealy’s mitigated this with a gel infusion that helps to keep things cool throughout the night. Support Layer – Directly below the comfort layer, you’ll encounter the pocketed coil system, which brings some bouncy support to the structure. The system is also outfitted with a special section of zoned support at the lumbar region that features Tempurpedic technology, ensuring optimal pressure relief along the spine. Like the Essentials, the Premium also includes a section of edge support coils, employed to maximize the usable area of the mattress. 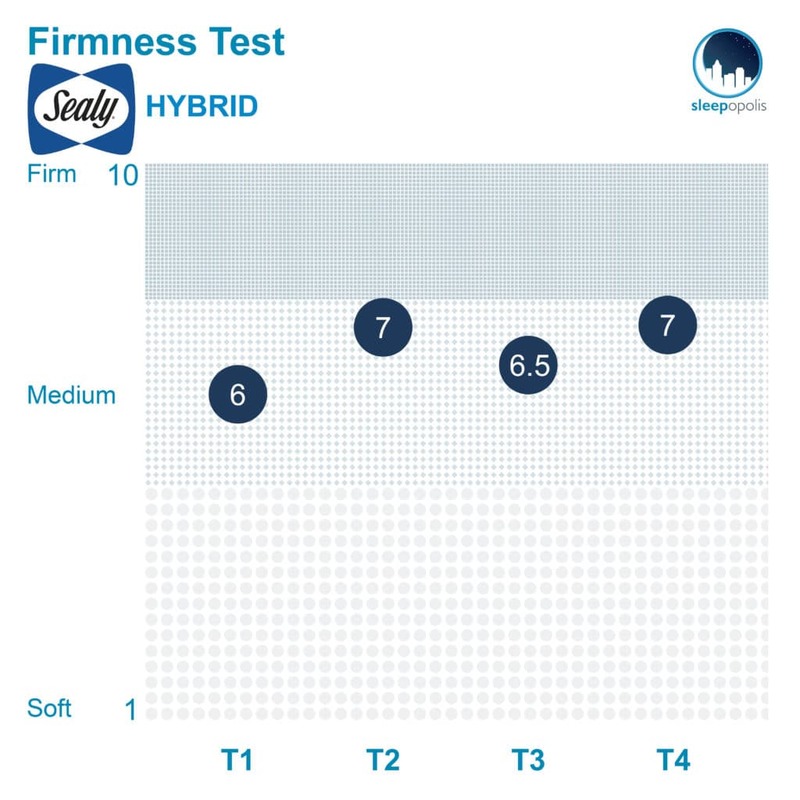 After taking a look at the construction of the Sealy Hybrid Premium, let’s chat about the firmness and feel. I started off by applying light hand pressure to the mattress and found that I was immediately interacting with the gentle memory foam comfort layer. I sank into this section with ease and found that the material contoured pleasantly around my hand. Pushing in further, I encountered the pocketed coils, which lifted me up and out of the structure. Since folks of varying body shapes and sizes are going to feel firmness differently, I decided to bring in three other testers to help me figure out how firm the Premium is. To do this, we each took a turn on the mattress and gave it a personal firmness rating. Afterward, we compiled them on the graph below! While feel is always going to be an individual thing, our responses should give you a good sense of the firmness range you can expect from this bed. There was a bit of variation among our responses, but we managed to land on an average firmness rating of 6.6. When compared to the industry standard of 6.5 for medium firmness, it seems as though this bed is pretty squarely medium firm. I personally gave the bed a 6, finding its thick layer of memory foam to produce a gentle, pressure-relieving feel. This isn’t to say that you’ll feel swallowed by the mattress; on the contrary, the pocketed coils do a great job of supporting the sleeper even as they sink through the comfort layer. 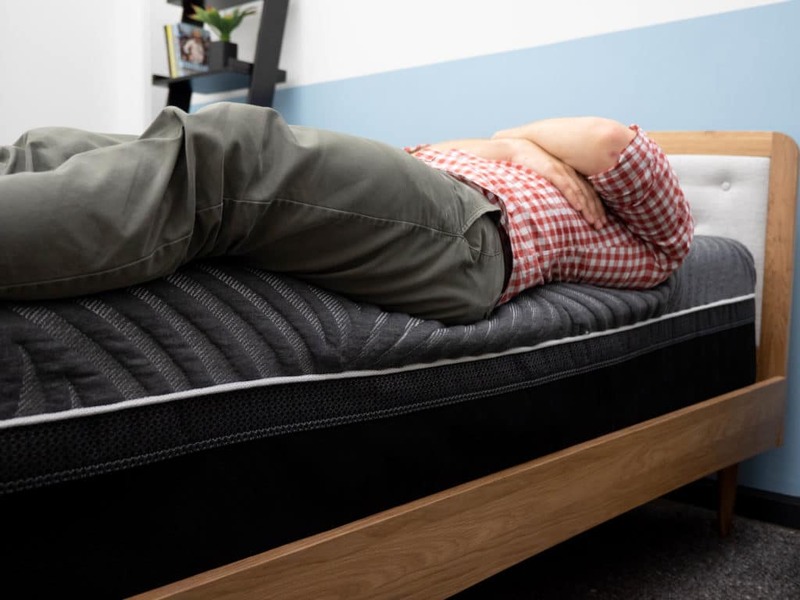 This combination of relief and support will do wonders for many sleepers, but is especially well-suited for those who doze primarily on their sides, which we’ll explore a little later on in this review. Keep in mind that this is the Firm version of the Premium. If you need something even softer, consider checking out either the Plush or Ultra-Plush models. Another important component of a bed’s feel is its pressure, or more specifically where pressure points are most likely to form while lying on top of it. To give you a better sense of where these tension spots might crop up, I placed a pressure map on top of the mattress and lied on my back, side, and stomach. You can see the results on the image below where pressure is represented from blue (low pressure) to red (high pressure). Back – Lying on my back, my weight was pretty evenly distributed across the surface of the bed. I could feel myself sinking into the memory foam comfort layer, with the material doing an excellent job of filling in the space at my lumbar region. While I could certainly feel the bounce from the pocketed coils, I would say that I felt a bit stuck in the memory foam, which made it somewhat difficult to move around and change positions. Edge Support – Scooting as close to the side of the bed as I could, I felt super secure. As with the Essentials, the extra edge support coils here really do maximize the usable surface area of the mattress, making it possible to sleep comfortably all the way to the side. For this reason, I’d say the Premium could be a good fit for couples who need a little extra room. Side – Rolling onto my side, I continued to feel well supported by the mattress. The memory foam contoured pleasantly to my shoulders and hips, providing these typical side sleeper problem areas with some cushiony relief. This all makes sense, as strict side sleepers tend to prefer softer mattresses like the Premium. Stomach – When I switched onto my stomach, I began to feel a bit of discomfort as my hips sank out of alignment with my shoulders. Unlike side sleepers, stomach sleepers usually go for firmer beds as they do a better job of keeping the spine in a nice, even line. That being said, strict stomach sleepers may want to opt for the firm Essentials collection instead of the Premium. 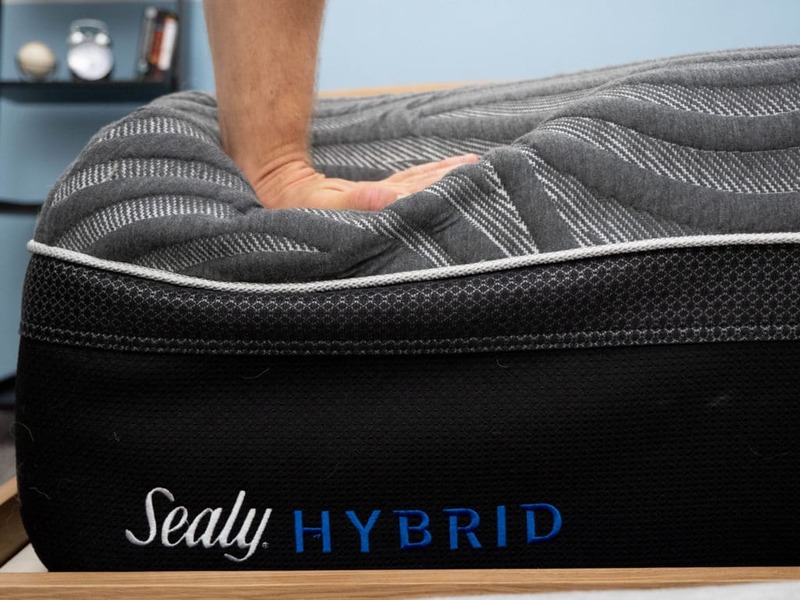 Now that we’ve gone over the finer points of the Sealy Hybrid Premium, I thought it might be useful to compare it to a few other beds I’ve reviewed. While mattresses are always going to have characteristics that make them distinct, it can be helpful to contextualize these individual specs against those of other beds on the market. After lying on the Premium for a few moments, I was immediately comparing it to the Ghostbed Luxe, the “premium” mattress from bed-in-a-box brand Ghostbed. Below, I’ll breakdown some of their most prominent similarities. Plush Vibe – Both beds feature an overall plush vibe, starting with their luxurious covers (a knit one for the Premium and a quilted phase change one for the Ghostbed Luxe) and stretching into their thick layers of memory foam. Cooling – The two mattresses are also designed to sleep cool as they’re both outfitted with cooling technology in their covers and gel infusions in their memory foam sections. Side Sleepers – Given their gentle feels, these beds are well-suited for those who sleep primarily on their sides as their contouring comfort layers provide excellent relief to the shoulders and hips. Another bed that came to mind while lying on the Sealy Premium was the Bear Hybrid, which also employs coils and foam for a sleeping experience that’s as pressure-relieving as it is supportive. Again, I’ll call out these mattresses most similar features. Hybrid Design – As the names imply, the Sealy Hybrid Premium and the Bear Hybrid both feature hybrid constructions. While the pocketed coils in the Bear may be shorter than those in the Premium, they still work to bring some great support to the sleeper. Luxury Feel – The Bear’s built with a quilted cover and soft foam top layers, which gives it a similar luxurious vibe to that of the Premium. Solid Edge Support – And finally, both of these mattresses feature pretty strong edge support, which allows sleepers to utilize their entire surface areas. In this next section, we’ll be taking a look at the Premium’s motion transfer, or the amount of disturbance detectable from one side of the bed to the other. While this test will be important to all sleepers, it’s especially relevant for those with a bed mate as it’ll let you know just how bothered you’ll be by their movements in the middle of the night. Showing the disturbance levels transferred across the Sealy Hybrid Premium when a ball is dropped to simulate a someone getting into and out of bed or rolling around in the middle of the night. 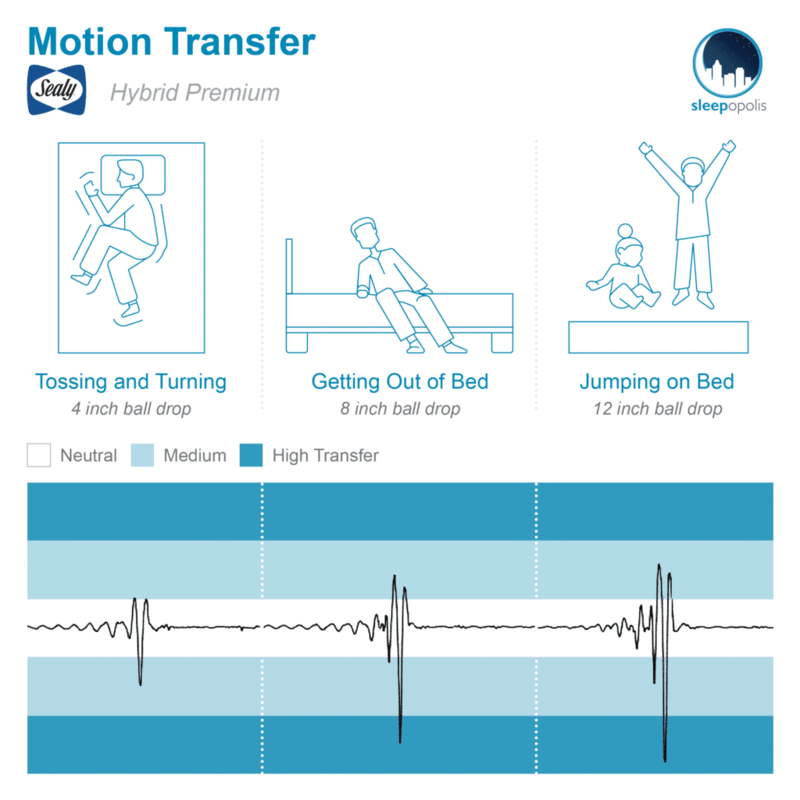 These are fantastic motion transfer results and tell me that you shouldn’t be too disturbed by your partner’s movements. 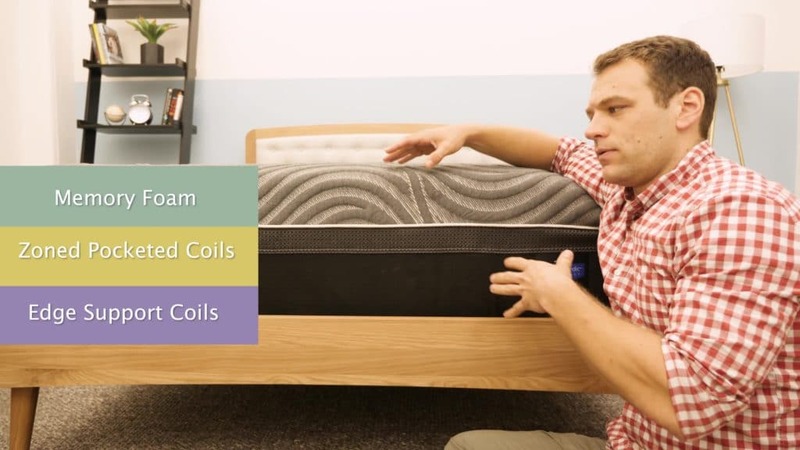 Not only does the thick layer of memory foam up top dampen motion across the surface of the bed, but the individually wrapped coils in the support layer help to evenly disperse it throughout the structure. And finally let’s take a look at sinkage. This section will help you visualize whether you’re going to feel like you’re sinking “into” the mattress or lying “on top” of it. 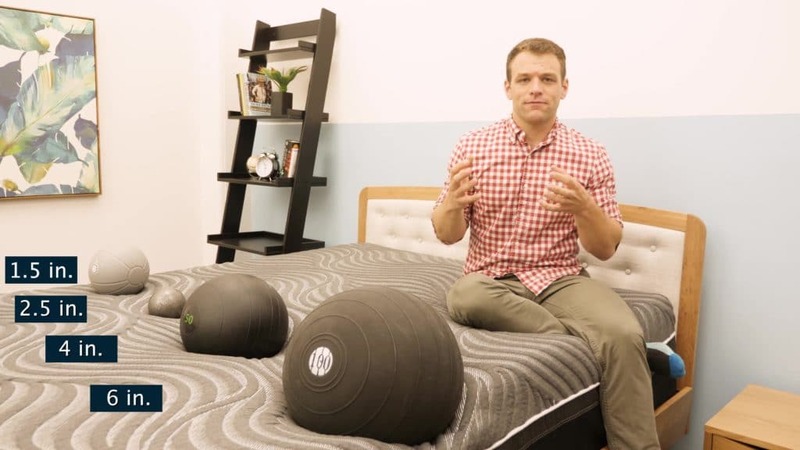 To demonstrate this, I placed four balls of varying sizes and densities (a 6 lb medicine ball, a 10 lb steel ball, a 50 lb medicine ball, and a 100 lb medicine ball) on the mattress and measured how much they compressed the surface. This is quite a lot of sinkage, especially for the 6 and 10 lb. balls. What this tells me is that you’re likely to sink through the memory foam comfort layer pretty quickly and then gradually sink deeper into the rest of the mattress. Though the pocketed coil system is going to do a good job of supporting your weight as it settles into the bed, you’ll probably feel more stuck in the Premium than you would in the Essentials. Purchase: Sealy doesn’t sell directly to the consumer, but interested buyers can snag the Sealy Hybrid line through Sears. Sleep Trial: 180 days but must try for at least 30. Shipping: Free for mattress purchases over $599. If you’re convinced the Sealy Hybrid Premium is the right mattress for you, the size and pricing information for the mattress are below. Please note that these prices reflect standard pricing, but coupons are often available. IS THE SEALY HYBRID PREMIUM MATTRESS RIGHT FOR YOU? With its thick layer of contouring memory foam, the Premium could make a great mattress for side sleepers in search of deep pressure relief. This bed could also be a fantastic fit for couples as it features both low motion transfer and excellent edge support. And finally, perhaps my favorite thing about the Premium is that its memory foam layer is infused with gel, ensuring that it stays nice and cool through the night. While side sleepers will likely enjoy the memory foam in the Premium, stomach sleepers may find it a bit too soft for comfort. Likewise, combo sleepers may find that the bed’s sinkage restricts their ability to move around and change positions. For more information on the Sealy Hybrid Premium, visit its website here!